I am always so intrigued by new flavor combinations, ingredients and infusions, especially when it comes to dessert. But classic desserts, like carrot cake, are not only delicious, but have built-in memories for me as well. When I think carrot cake, I not only think of a dense, moist cake studded with walnuts, raisins, carrots and pineapple, I also think about egg hunts in my new spring coat, sitting down to dinner with my mom’s pastel tablecloth and napkins embroidered with rabbits, and stealing the black jelly beans from my sisters’ Easter baskets. Carrot cake holds a special place in my heart. But carrot cake is more of a special occasion treat, especially if there’s frosting involved. 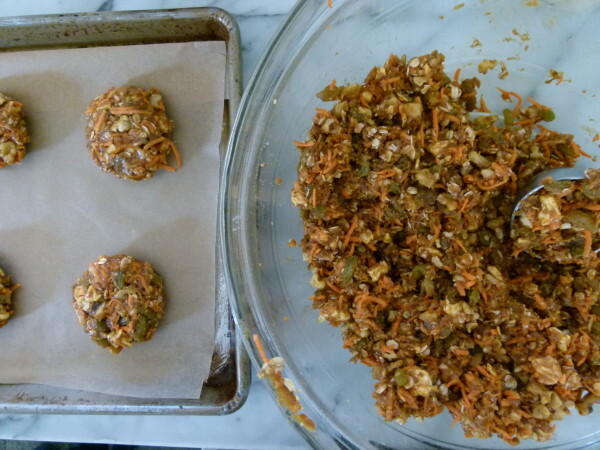 Carrot cake cookies, on the other hand, feel like an everyday treat or a more reasonable serving size if you just want a little something for dessert. I think these wholesome cookies would be as welcome on my Easter dessert table as they would be in a lunchbox or Easter basket. 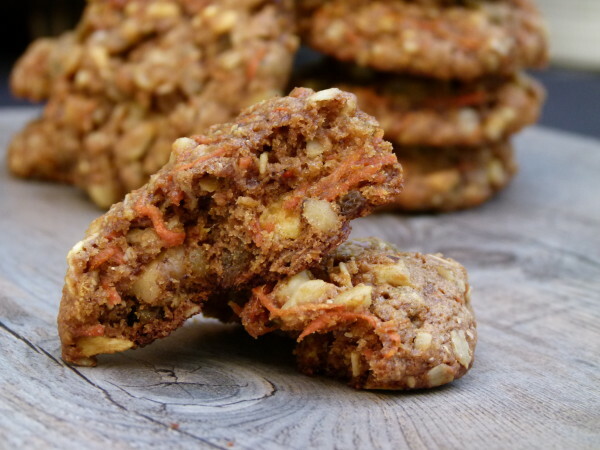 This cookie is just my type– chunky, hearty and substantial, lightly sweet and busting with all the good stuff you’d expect to find in a carrot cake. Maybe it’s because of the unrefined sugar, or maybe it’s because of the fiber-rich oats and whole wheat flour, but these cookies don’t make me crash and burn like a typical cookie would. Whereas I am not exactly endorsing these as tomorrow’s breakfast, I do think they are a higher quality sweet treat. I am sure there are many ways to adapt the recipe to dietary intolerances. Drop the walnuts for sunflower seeds to make them nut-free. Use a flax egg in place of the real egg so they become vegan. Use 1/2 GF oat flour and 1/2 King Arthur Multi-purpose GF flour + 1/2 teaspoon xanthan gum for a gluten-free cookie. I also know that not everyone likes pineapple or raisins, so feel free to drop either of those. I would just caution against omitting one than one add-in, since you’ll lose some of the support for the cookie. If you wanted to get fancy, you could drizzle the cookies with a little icing (basically 1 cup powdered sugar + 1 – 1 1/2 Tbs. water whisked together.) Or you can take a look at something a little less naughty — my cashew frosting — and use that to frost a little swirl on top. After all, what’s Easter without a little decadence? That’s how I remember it. Preheat the oven to 375 degrees and line two baking sheets with parchment paper. 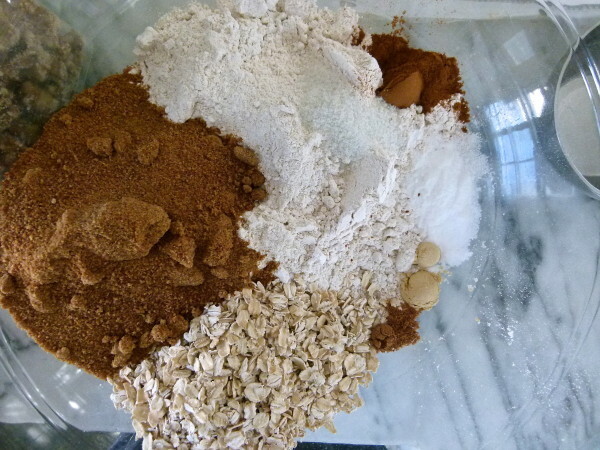 In a large mixing bowl, whisk together the flour, oats, baking soda, cinnamon, ginger, nutmeg, salt, and sugar. In a medium mixing bowl or blender, combine the coconut oil, egg, and vanilla, and blend until well emulsified. Pour the wet mixture into the dry mixture and stir until combined. 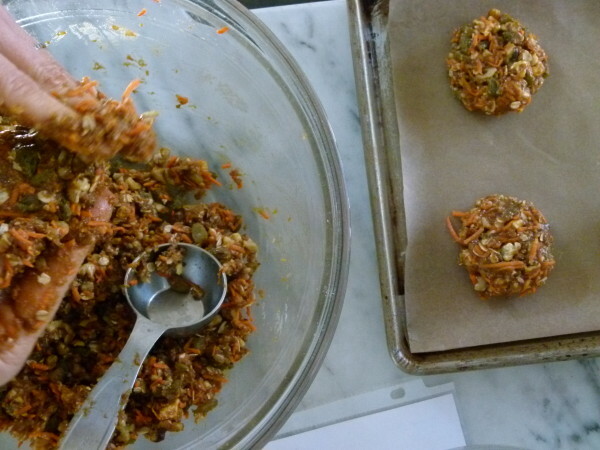 Fold in the carrots, walnuts, raisins, and pineapple. 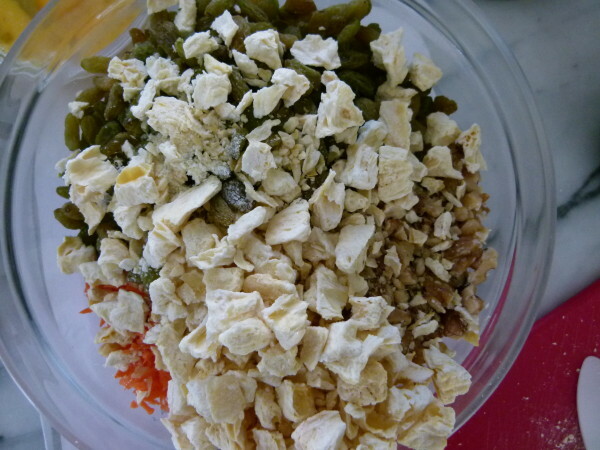 Mixture will be very crumbly. Use your hands to combine if necessary. Using your hands, take about ¼ cup of the batter and form it into a small disk. Place on baking sheet leaving space between each cookie for them to expand. Bake for 15-18 minutes until golden around the edges. *For a GF version, sub ½ GF oat flour and ½ King Arthur Multipurpose GF Flour and ½ teaspoon xanthan gum. 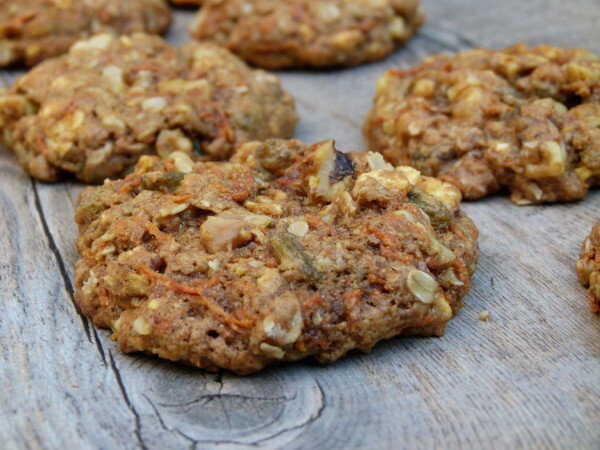 Do you think these would work with either whole grain oat flour or spelt flour? Sorry I meant to ask this question regarding the “thumbprint” cookies! Commented on the wrong post by accident…..! Ah, got it. Yes, either of those flours would probably work just fine for the thumbprint cookies! This is definitely something I would try, I love carrot cake and due to the fact that I have a sweet tooth, these cookies would be gone before dinner. I’ve recently tried these incredible cookies, that have all natural ingredients, http://www.cooperstreetcookies.com/, this is something I would definitely recommend. 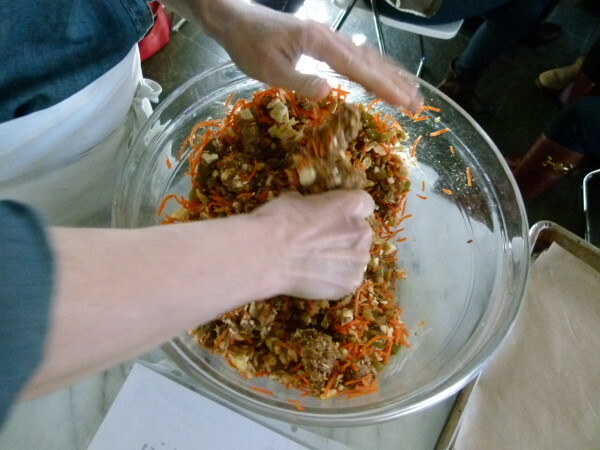 I could not wait to try this recipe because I am a carrot cake fanatic. The cookies were delicious (definitely easy-peasy), but since I really don’t care for pineapple in carrot cake, I substituted dates. My husband does not eat sweets (opposites do attract), and he could not stop eating the cookies. In fact, he kept saying, “You don’t have to give these away, do you?” Now that is the supreme compliment! Many thanks, as always! “opposites do attract” haha!! Thanks for the comment. Looove the sub of dates for pineapple — superb! Can you find dried pineapple at Whole Foods? I found freeze-dried pineapple at Whole Foods and dried (more chewy like a raisin) pineapple at Trader Joe’s. But healthy and pretty… Hmmm) any suggestions? Easter fun! I don’t think the natural pastel coloring has sugar, does it? I think it should be fine to use! 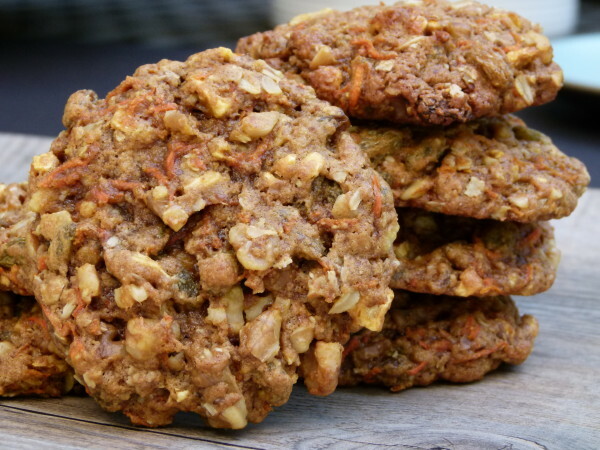 My kids absolutely love your Carrot Cake Oatmeal cookies and always ask for the “good-for-you” or the “healthy” cookies. So easy to make! Thank you!